Happy Friday everyone! It has been fairly crazy week in our household. River has been sick and I feel that I’m constantly in catch up mode. But we are looking forward to the weekend which I’m planning to fill with all of my favorite fall things. Today I’m sharing another versatility exercise with the Virtual Romper from Encircled. Versatility is so key when creating a minimal wardrobe. Having an understanding of how far you can take the pieces in your wardrobe will help you make wiser shopping choices in the future. For example, if you know that one pair of pants that you love only feels good to wear when paired with heels and nothing else, then you know just having that one pair is fine. If you have another item that can be paired with a bunch of different pieces in your closet and you love the outfit every time then it’s safe to say you can invest in similar pieces. So to kick off your weekend, I’m going to share a little about Encircled in case you aren’t familiar with them, my five looks I created with the Virtual Romper as well as style tips! Encircled is based in Toronto, Canada and their garment production is 100% made in Canada. The brand was founded by Kristi Soomer after she had been traveling hundreds of thousands of miles for work and needed clothing that could accommodate her always on the go needs. Kristi became frustrated with the current clothing options and decided to design her own line which combines function, versatility & design. I greatly admire how Kristi designers her pieces. She not only looks at it from a pure design/aesthetic perspective but she takes into account the pieces’ versatility and its’ timelessness. Encircled’s motto is “Be More with Less” which resonates strongly with my personal values and mission for my own closet. Mixing vintage denim with more dressed up pieces is one of my favorite style tricks. 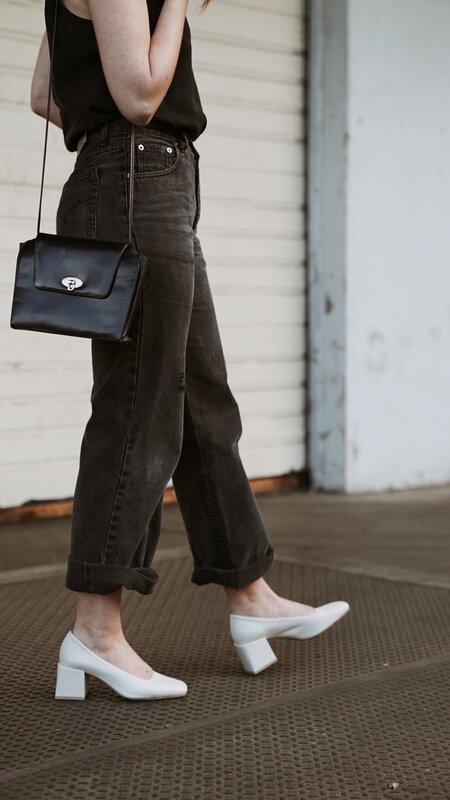 I love the charcoal grey of the jeans mixed with the black tencel top and pop of cream in my shoes. The subtle color different between the top and jeans make the outfit so much more interesting. If my jeans had been black the look would have been a little too simple for me. This outfit is perfect for a happy hour or date night and could be easily even more dressed down for a day of activities. Lately, this is one of my most common outfit combinations. Wide leg crop pants + tee + sneakers. It is perfect for transitioning from summer to fall. I love the higher crop on these pants and the tencel allows them to flow so nicely. Combine those two elements with a high waist and pockets and you pretty much have the making of my favorite pants! There’s something so special about slipping on a pair of pants that don’t feel constricting or even remotely stiff. Don’t get me wrong. I love my denim but every now and then it’s nice to slip on something that is refined but 100% comfortable in every sense of the word. Since I was wearing a white tee with this look I decided to add my canvas tan sneakers to the look instead of chunky white ones. 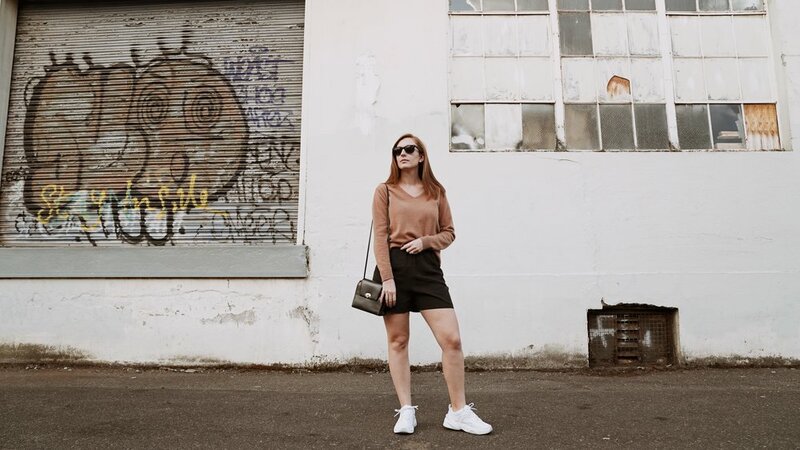 I’m all about adding warmth to outfits lately and this sneaker plus the handles on my handbag did the trick! Sidenote on the handbag, I love how it’s just a random pop of fancy with this otherwise basic every day look. Pairing Encircled’s Remix Boxy top and Remix shorts is my favorite way to wear these pieces. I decided to dress it up a bit by adding my houndstooth blazer and cream heels then added my clear handbag as an unexpected element. Funny enough I forgot my jewelry bag when I took these photos otherwise I would have worn my large gold hoop earrings to finish off the look :) In my past I probably would have paired a black heel with this look but I love the contrast the cream shoe brings. I wanted the faux romper to be the focal point but the rolled cuffs, clear handbag and heels add just enough of a style element. When working with these pieces I knew I wanted to highlight the full faux jumpsuit affect in some way. I first tried it with a white tee underneath the top for warmth and while it was cute I couldn’t exactly make it work. Since I did want to make sure the outfit was weather appropriate for fall, I went with adding my canvas clyde jacket from elizabeth suzann over top. I thought about adding a long cardigan but love how the jacket and a structured element. It’s also a jacket that is comfortable enough to wear indoors. The textures & colors of this look are some of my favorites. The canvas jacket accentuates the flow and drape of the remix pants beautifully and the canvas sneakers and just the right amount of warmth to balance the cognac jacket. Overall, love this look and will be repeating it over and over again this fall! I want to say thank you to Encircled for sponsoring this post. I decided to work with Encircled due to their efforts in creating sustainable practices from material sourcing to full garment construction as well as their thought process for when designing new garments. Also, this post does contain affiliate links. If you shop through those links I will receive a small commission. Than you for supporting the brands that support The Thoughtful Closet!